The northeastern corner of Prince Edward Island is dotted with attractions, and you will likely begin your journey looking forward to reaching those destinations. But you may find along the way that the glorious stretches in between – the pristine beaches and stunning vistas – are slowing you down, distracting you from getting to wherever you thought you were headed. You’ll have trouble keeping your eyes on the road, and will seek out places to pull over so you can get a better look. And you may even begin to understand what those earliest settlers felt as they arrived here, hundreds and even thousands of years ago, from other parts of North America and from Europe. True, the voyages were treacherous, requiring passage over rough terrain and fierce seas. Many pioneers, looking to escape persecution, were met with more of the same in their new homeland. And of course, the winters were brutal. So why travel to the edge of this tiny island, floating near the fringe of a vast continent? The answers are simple: abundance and beauty. The rivers, lakes, and surrounding waters were filled with fish. The soil was rich, perfect for growing a variety of fruits and vegetables. Animal life was equally plentiful, with very few dangerous predators. There were no high mountains to contend with, no landslides or waterfalls. And the landscape was – as you will soon discover – mesmerizing. One of the advantages we enjoy over those early settlers is the ability to travel quickly and comfortably. As a result, we can see so much more in much less time. Here are suggested day-trippers. (Substitutions are definitely allowed.) Be sure to take your camera, and lots of film or a high-capacity memory card. Start at Priest Pond, heading east on Route 16. Almost immediately you’ll catch glimpses of the water and dunes at Jimmy’s Point, then Campbell’s Point, off to the left. 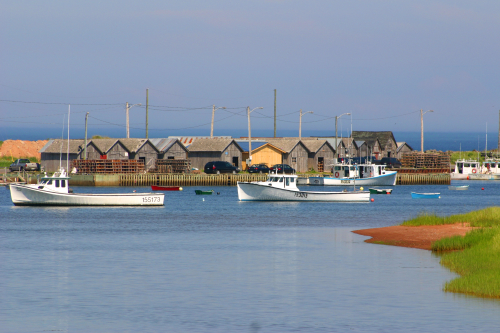 At Campbell’s Cove, you’ll find a typically-beautiful PEI beach: white sand, red cliffs, white-capped blue water. Just past Fairfield, the road splits to encircle North Lake. Turn left to discover North Lake Harbour and Beach, a picturesque fishing community offering deep-sea fishing charters, seal watching cruises, and plenty of photo opportunities. The view from here is both breathtaking and a bit surreal: the gulf to your left, the lake to the right, the quaint wharf straight ahead -- and off in the distance, ten huge wind turbines (81 metres tall) standing in a row. The East Point Wind Farm stretches from Elmira Road to East Point.) If deep-sea fishing, including bluefin tuna, is your passion, North Lake is the place for you. Check out MacNeill’s Tuna & Deep Sea Fishing or Tony’s Tuna Fishing and Scenic Tours. If you’re interested in pioneer history, there are several early cemeteries and monuments to the Acadian settlers in this area. Route 16 will take you to East Point, a dramatic place where opposing tides meet. The lighthouse is 19.5 meters high (64 feet), and is open to the public. Guided tours run from mid-June to Labour Day. (Learn how the lighthouse was dragged to a new location in 1883 – and why.) Be sure to visit the craft shop for locally-made gifts, and perhaps sample a bowl of chowder, as well. Then head south on Route 16, soon turning right onto Route 16A in the community of South Lake. In just a few minutes you’ll arrive in Elmira, site of the Elmira Railway Museum. Here you can learn about the history of the railroad on PEI, enjoy a picnic, visit the gift shop, and even ride in a miniature train. Open June through September, with special festivals and events in the summer. As you head back, slow down where 16A meets Route 16, and maybe even pull off into the parking lot of the South Lake Christian Church to really soak in the stunning coastal view. Just a bit down the road is Bothwell Beach, and another beautiful view from the Kingsboro Look-Off. (Also in Kingsboro: Black Pond Bird Sanctuary.) Watch for signs leading you to Basin Head Provincial Park and Beach. This is a favourite spot with both Islanders and visitors,this beach was named the #1 beach in North America in 2014, because of the boardwalk, private picnic areas, gift shops, change rooms, and children’s play village. The beach here is famous for its singing sand, and for the bridge from which you can leap into the deep waters that funnel between a small lake and the shallows of the Northumberland Strait. It’s also the perfect place for a leisurely walk. And for a little education: PEI’s provincial museum is not one facility, but rather consists of seven different locations around the Island. Two of them are in the Eastern Beaches region; one is the Elmira Railway Museum, and the other is the Fisheries Museum here at Basin Head, housing the province’s largest collection of fishing artifacts. More gorgeous beaches await: Red Point Provincial Park and Little Harbour. If you have time for a side trip Rte 303 takes you to two little red roads, The Glen Scenic Heritage Road and The New Harmony Scenic Heritage Road. In Souris, stock up on picnic supplies at the IGA supermarket. Or visit one of numerous restaurants, diners, fast-food establishments, or bakeries (the Blue Fin Restaurant and the Right Bite Café, to name just two). The Matthew MacLean Building houses a Visitor Information Centre and historical displays of the first settlers. You can find more history at St. Mary’s Roman Catholic Church and cemetery towering over the town. Souris is home to several art galleries, including Naturally Yours Art Studio & Gardening Center. And if you’re headed to the Magdalen Islands, the ferry is here, too at Souris Harbour, and lighthouse. You can’t help but notice the majestic beaches at Souris Beach Gateway Park as you leave the seaside town. Route 2 West will take you through the lovely town of Rollo Bay. If it happens to be early July, don’t miss the Annual PEI Bluegrass & Old Time Music Festival followed a couple weeks later by the Rollo Bay Fiddle Festival. From early May to late October, Myriad View Artisan Distillery offers tours and tastings of Island spirits. The bell at St. Alexis Church has its own amazing story of Acadian struggle and survival. And of course, the incredible views are here year-round. From Rollo Bay, head west on Route 2, but not for very long. At Rollo Bay West, follow Route 310. Just a little farther down the road is the spectacular Inn at Bay Fortune, the birthplace of television’s The Inn Chef and widely recognized as one of the Island’s best places to eat (dinner only, late May to mid-October) now owned by Chef Michael Smith himself. Be sure to visit their gardens. For a combination of sea glass and fine art silver smithing, don’t miss one-of-a kind jewellery at Fire & Water Creations. As you leave Bay Fortune Harbour and continue on Route 310, take your time and enjoy the water views in Eglington and Howe Bay. When you reach Little Pond, turn left toward Sally’s Beach Provincial Park. In addition to the white sand beach, the park features a picnic shelter, washrooms, and two hiking trails. The nearby Inn at Spry Point With stunning gardens and ocean views in almost every direction, this is the perfect setting for birdwatching, beachcombing, hiking, or biking. Head back to Route 310, then bear left to reach Annandale Beach and Wharf. This is a great spot for kayaking, and clam digging at low tide. When 310 meets the Rte 4 highway, you may want to turn right to visit Shepherd’s Nook Springwater Farms in Albion Cross. The sheepshin products are for sale and a hayride can be prebooked. Back again on Route 310, heading south, turn left onto Route 4 at Dundas. In nearby Bridgetown, you’ll find hiking and water trails on the beautiful Boughton River. The 12.5 km water trail is ideal for canoes or kayaks, and features six docking stations. The 4.5 km Hiking Trail wanders along the river’s estuary, with signage describing local wildlife and habitats. Keep your eyes open for bald eagles and Great Blue Heron. For horseback riding in a pastoral setting, visit Forest Hill Multi-Use Trail (take Route 328 from Bridgetown or Route 312 from Primrose). Otherwise, turn left from Route 4 onto Route 311 and enjoy the scenic ride through St. Georges and Launching, and on to another wonderful beach at Launching Point. If you like stained glass, you’ve come to the right place as This is it Stained Glass Studio in Launching shows off this art form in a warm and attractive environment. Continue on Route 311 for the second half of the trip around the penninsula. It’s a peaceful and picturesque journey through Newport, Seal River, and Cardigan North, with terrific views of the Cardigan River, Mitchell River, and Cardigan Bay. Be sure to visit the Cardigan Craft Centre and Tea Room which starts the Three Rivers Discovery Drive.